By Miriam Valverde on Friday, February 15th, 2019 at 3:01 p.m.
President Donald Trump declared a national emergency in order to move forward with his campaign promise of building a border wall with Mexico. Trump didn’t lay out specifics about the declaration during a news conference at the White House. He said he anticipates legal challenges to his action even though national emergency declarations have "been signed many times before." "There's rarely been a problem. They sign it, nobody cares. I guess they weren’t very exciting, but nobody cares. They sign it. For far less important things in some cases, in many cases," Trump said Feb. 15. "We are talking about an invasion of our country, with drugs, with human traffickers, with all types of criminals and gangs." National emergency declarations are signed relatively frequently by presidents, but Trump downplays the political implications of his move and the fact that many immigration experts and lawmakers question the existence of the crisis Trump says justifies his declaration. The National Emergencies Act of 1976 allows presidents to declare national emergencies. President can issue their own national emergency declaration and renew declarations from past presidents that have not expired. A Brennan Center database says there’s been at least 58 national emergency declarations since November 1979, and 31 are still in effect. They often deal with situations related to foreign affairs and rely on powers under the International Emergency Economic Powers Act. Past declarations also followed the 2009 H1N1 influenza pandemic and the 9/11 terrorist attacks. The 1976 law doesn’t specify a legal definition for a national emergency, it rather creates procedural requirements for declarations. For example, a president needs to specify the statutory authorities he or she is invoking to address the national emergency. Declarations also need to be renewed every year, or they will automatically expire. Trump said his action was necessary "because we have an invasion of drugs, invasion of gangs, invasion of people, and it is unacceptable." But Trump inflates data and leaves out key facts and context. Drugs: Illicit drugs do come into the United States from the southern border, but federal data and reports say that a significant amount gets through legal ports of entry. Most heroin, for instance, comes in private vehicles and in tractor-trailers, co-mingled with legal cargo. Gangs: Nationwide apprehensions of gang members are down from a few years ago, according to Customs and Border Protection data. In fiscal year 2018 there were at least 728 gang members apprehended, up from 536 in 2017. (Fiscal year 2018 data is up to Aug. 31, 2018; the fiscal year ended Sept. 30, 2018.) But the available data shows that more gang members were apprehended in 2014 (1,034) and 2015 (844). The Customs and Border Protection data also does not specify how many were apprehended at the southern border, where Trump wants a wall. Immigrants: The total number of people apprehended during Trump’s time in office has been far below the numbers apprehended in the 2000s. In fiscal year 2000, the Border Patrol recorded more than 1.6 million apprehensions at the southwest border. During each of Trump’s years in office so far, Border Patrol has apprehended fewer than 400,000 people. Given that overall apprehension levels at the southwest border are not at a record-high and that the majority of people arriving at the border are families and children, experts questioned Trump’s argument. Trump’s decision to declare a national emergency comes after Congress refused to spend $5.7 billion on construction of a U.S.-Mexico border wall. Failing to get a deal on a policy priority doesn’t create an emergency, said Ilya Shapiro, director of the Robert A. Levy Center for Constitutional Studies at the libertarian Cato Institute. "This action violates the spirit of the National Emergencies Act (which set limits on previously nebulous presidential authority)," Shapiro said. "Even worse, it sets a terrible precedent for future administrations, whose policy goals may be radically different." Daniel Costa, director of immigration law and policy research at the left-leaning Economic Policy Institute, said in a statement that the real challenge is many people seeking asylum, not those trying to sneak across the border. "Families and children arriving at the border and asking for help are not a threat to America or a national emergency that will be remedied by a wall—they represent a humanitarian challenge that warrants a robust response to ensure the safety of people fleeing desperate situations in Central America, one of the most violent and crime-ridden regions in the world," Costa said. "I expect to be sued," Trump said. House Speaker Nancy Pelosi, D-Calif., also expects him to be sued. Trump’s actions "clearly violate the Congress’s exclusive power of the purse, which our Founders enshrined in the Constitution. The Congress will defend our constitutional authorities in the Congress, in the courts, and in the public, using every remedy available," Pelosi tweeted. 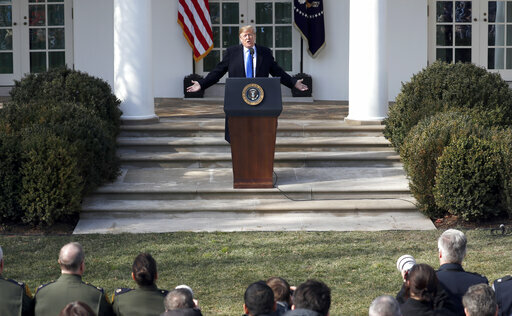 The National Emergencies Act creates an expedited procedure for Congress to vote on a resolution to end an emergency declaration, which would have the power of law, said Elizabeth Goitein, co-director of the Liberty and National Security Program at the Brennan Center for Justice at NYU School of Law. Trump told reporters that while he got some funding for border barriers in a new spending bill, he wasn’t happy with that and wants to get the wall built quickly. "I could do the wall over a longer period of time," Trump said. "I didn’t need to do this, but I’d rather do it much faster." "We have an invasion of drugs, invasion of gangs, invasion of people, and it is unacceptable."